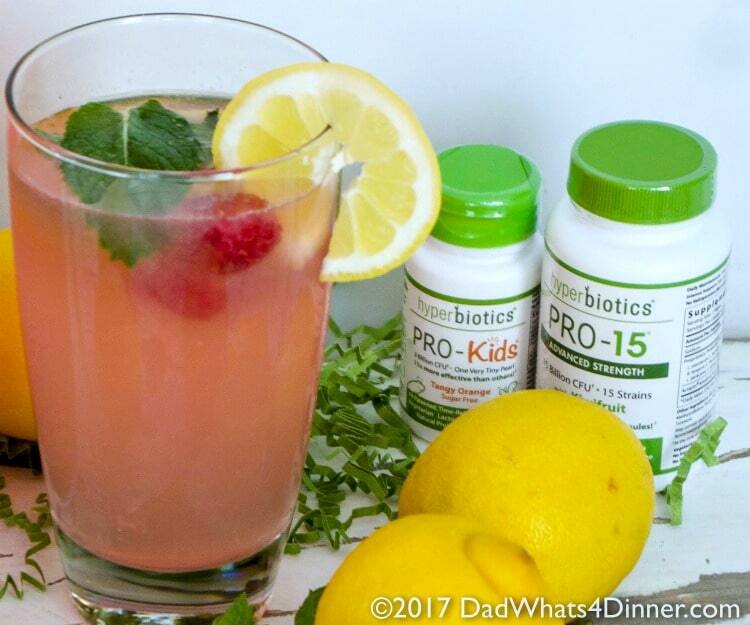 Probiotic Pink Lemonade is a healthy, fizzy, fermented drink perfect for summer, sure to keep your gut in shape. Sweet and tart with beneficial probiotics. When I was a wee little lad I had stomach issues. The doctors believe I was lactose intolerant. Luckily just before attending kindergarten I started to get over my allergy. Unfortunately I think this has messed up my stomach and internal function for most of my life. I have battled stomach issues such as acid reflux and a weak stomach. My lifestyle and job doesn’t help. I have tried probiotic’s in the past with good results. 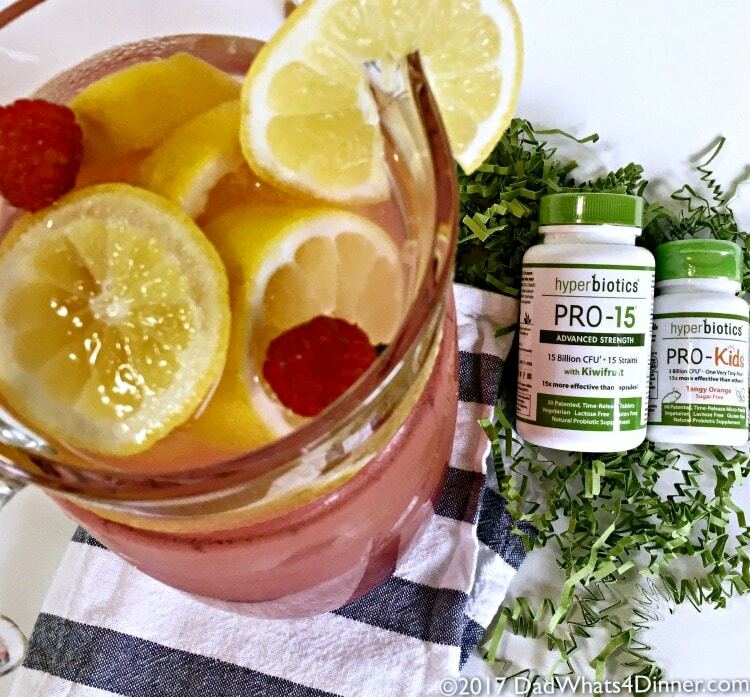 So for this summer I am trying to fix my diet and my gut using Hyperbiotics Pro-15 from Target and also trying to increase probiotics in my families diet. Hyperbiotics, available at your local Target store, is the world’s most effective probiotic supplements and sold at an affordable price! The Pro-15 I am taking is easy to swallow, time released and promotes daily relief from gas, bloating, and irregularity. Definitely issues I deal with daily. 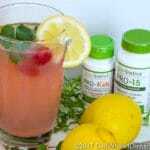 So to compliment the Hyperbiotics I created a probiotic rich Pink Lemonade as a refreshing drink for summer. While taking Hyperbiotics, eating better and drinking my lemonade it just might be a comfortable summer and hopefully the rest of my life. My oldest son also seems to have my stomachs problems so I have started him on the Hyperbiotics for kids. 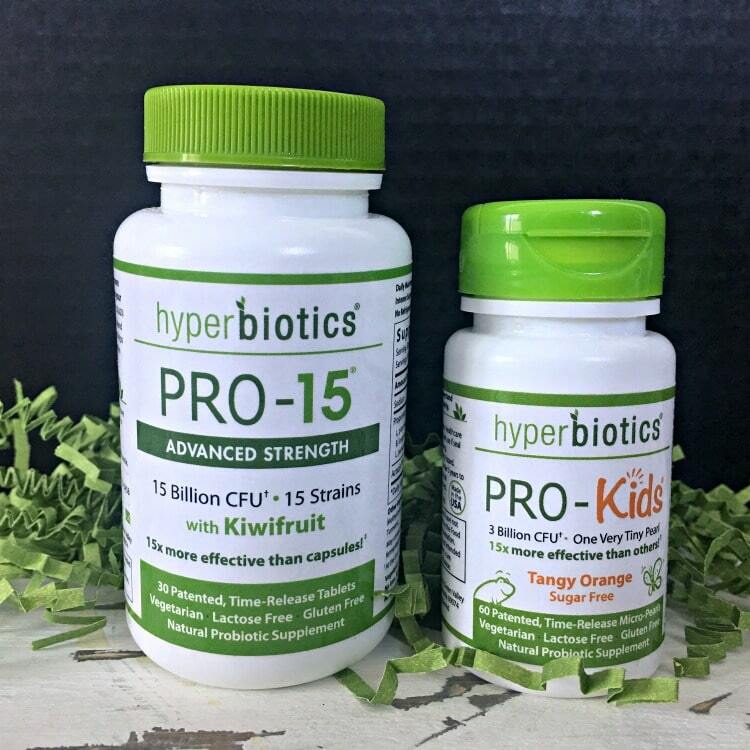 Hyperbiotics Pro-Kids is small, so it is easy for kids to swallow especially for those little ones who hate to take pills. As a bonus Pro-kids is sugar-free and contains zero artificial flavors, colors or sweeteners. My son will be working long hours this summer so he will need to keep his gut in good shape. To learn more about Hyperbiotics check out their website here. So #followyourgut this summer and visit Target and purchase your own Hyperbiotics. 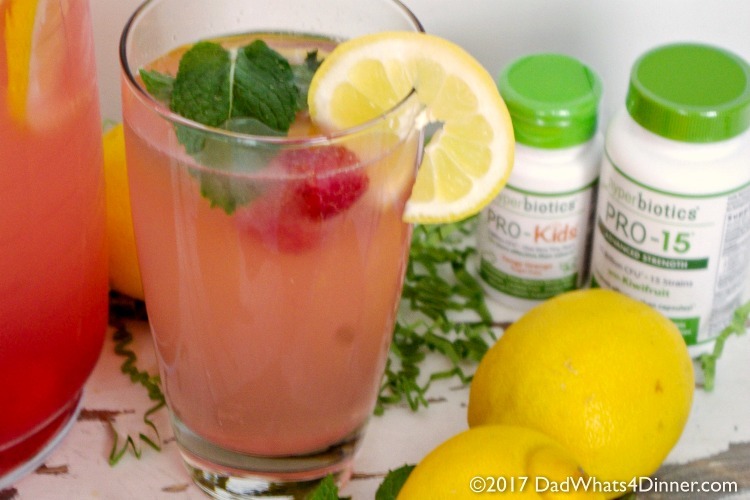 Probiotic Pink Lemonade is a healthy, fizzy, fermented drink perfect for summer and sure to keep your gut in good order. Sweet and tart with all benefits of probiotics. Combine water and sugar in a gallon jar. Add lemon juice, 1/2 cup raspberries. Add the whey, making sure the mixture is at room temperature. Cover tightly and let sit on the counter for 48 hours. 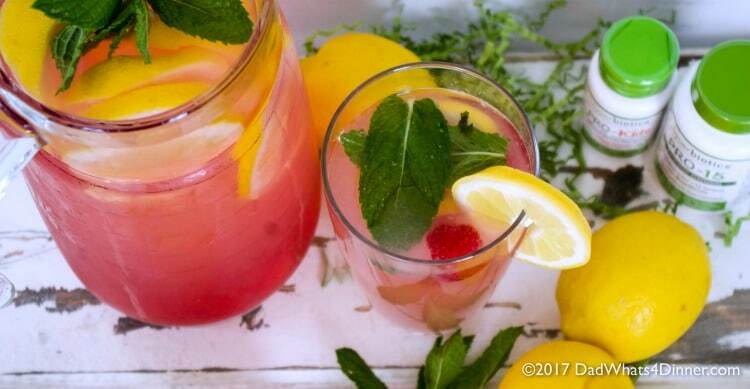 Pour the lemonade through strainer into a serving pitcher. Add lemon slices and remaining raspberries. If too tart add a few drops of stevia. I will be bringing my Probiotic Pink Lemonade recipe to Freedom Fridays, Friday Favorites, Fiesta Friday, Weekend Potluck, What’s Cooking Wednesdays. Checkout my Link Parties page for other great places to find new recipes. These statements have not been evaluated by the Food and Drug Administration. These products are not intended to diagnose, treat, cure, or prevent any disease. Probiotics support many facets of overall health when taken regularly as part of a balanced diet and healthy lifestyle. "Quinn is the author, photographer and recipe designer over at DadWhats4Dinner. He enjoys cooking for family and friends and being creative in the kitchen. He makes ordinary everyday food extraordinary. He lives just north of Cincinnati with his wife of 24 years, three kids and three cats. His kids have well-developed palates and his youngest daughter is now working with him on the blog creating recipes for her own page "Cooking with Ella". Follow him on: Facebook, Pinterest, Twitter or Instagram." oh I love a good pink lemonade! This looks amazing. And, I’m with you, I love a good probiotic! I just ran out of mine and will have to try these ones! Glad to hear it Kristen. Thanks for stopping by! My mouth is watering looking at this–mmm yum! I cannot wait to try this lemonade recipe! Great for spring and summer. I love to learn about these types of offerings. I will certainly be researching further. Thanks for stopping by Dr. Ho! Oh, I need to try this!! I love pink lemonade. Thanks so much for sharing! It is really good and healthy too! Thanks for stopping by Jessica! What a cool idea! I never thought about this. Thanks for stopping by Mira! This looks so tasty. Can’t wait to try it! Pink Lemonade is my favorite! That is a great idea to incorporate your probiotics into it! Thanks Lisa. Give it a try. What a great way to get probiotics!